Pedro Caixinha has been granted permission to join Rangers from Al-Gharafa, the Qatar club have announced. The Portuguese, 46, had been heavily linked with the vacancy following Mark Warburton's departure last month. Under-20s coach Graeme Murty has been in charge of Rangers' first team for their last five matches and they play Celtic on Sunday. Rangers are also keen to appoint a director of football. However, Southampton's director of scouting and recruitment Ross Wilson declined an offer to take up the role earlier this week. 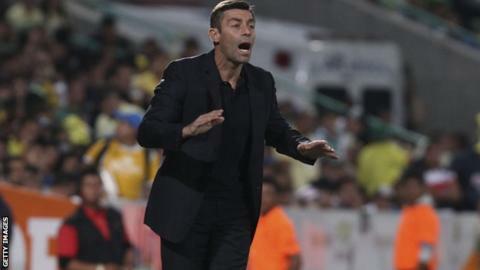 The former manager of Uniao Leiria and Nacional in his home country, Caixinha led Mexican side Santos Laguna to the 2014 Copa MX Apertura trophy, the 2015 Liga MX Clausura title and the 2015 Campeon de Campeones trophy, as well as the 2013 CONCACAF Champions League final. Before moving into management, he spent six years as assistant to Jose Peseiro at Sporting Lisbon, Al-Hilal, Panathinaikos, Rapid Bucharest and the Saudi Arabia national team. Caixinha, who speaks fluent English, earned some of his coaching qualifications at the Scottish Football Association's coach education centre at Largs. Since being put in charge of Rangers' first team, Murty has overseen Scottish Cup wins against Greenock Morton and Hamilton Academical and a Premiership victory over St Johnstone as well as league defeats by Dundee and Inverness Caledonian Thistle. The Ibrox side are third in Scotland's top flight, six points behind Aberdeen and 33 off runaway leaders Celtic, who can clinch a sixth straight title this month. Warburton, who led Rangers to promotion by winning last season's Scottish Championship, parted with the club at the same time as assistant David Weir and head of recruitment Frank McParland and McParland has since become director of football at Nottingham Forest.